University of Virginia engineering students will soon deliver to aerospace company SpaceX a small, cube-shaped spacecraft of their own design and construction for launch in late November from the Kennedy Space Center in Florida. The craft, known as a “CubeSat,” will be used in a NASA mission to better understand the effects of atmospheric drag on spacecraft and debris orbiting Earth. 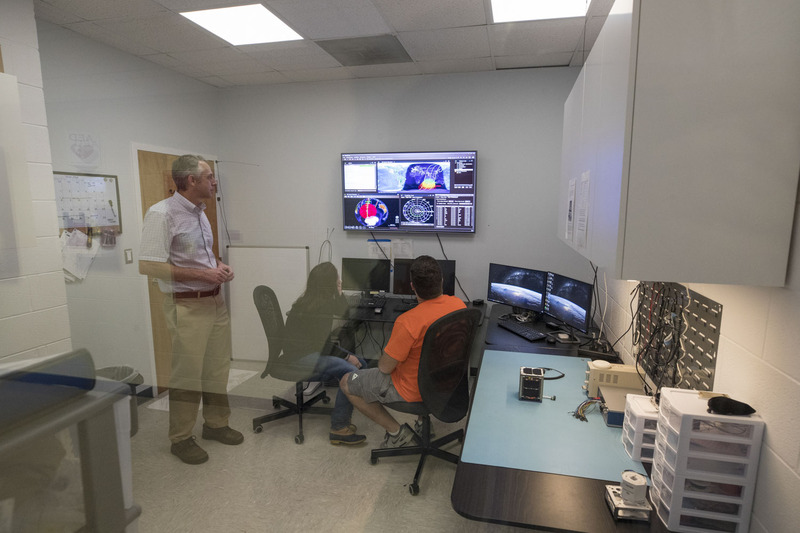 During the six-month mission, students working with their mentor, mechanical and aerospace engineering professor Chris Goyne, will track the craft by radio as it passes over from horizon to horizon on each orbit. They will gather and analyze data while working closely with student teams at Virginia Tech and Old Dominion University, which also are deploying CubeSats, and with Hampton University. The universities are working together under the umbrella of the Virginia Space Grant Consortium. The roughly softball-sized spacecraft, named “Libertas” for the Roman goddess of liberty, is slated to be launched into space atop a Falcon 9 rocket and delivered to astronauts aboard the International Space Station via a Dragon capsule. Astronauts then will deploy the three university-built CubeSats as a “constellation,” each craft flying on its own. Students at each of the participating universities will record and analyze the crafts’ slow descents back to Earth over months, until the tiny objects burn up in the ever-thickening atmosphere. This summer, five of Goyne’s students worked hard to finalize preparation of Libertas for the rigors of space flight. Exceptionally hard. The students, working on a grant from the Virginia Space Grant Consortium, said the project has allowed them to be both independent thinkers and team players as they’ve worked their way through a seemingly endless series of problems and challenges, from design and construction of the craft to writing the computer code for its operation. Puckette and LaCour said the CubeSat project has provided valuable on-the-job training, as they have worked as engineers on a real-world – or, out-of-this-world – NASA mission. They’ve made countless calls to engineers, technicians and other experts at the space agency, and to aerospace and computer companies as they built their expertise in areas that transcend what they’ve learned in Engineering School classes. They’ve also met with, and coordinated planning with, their student colleagues at the other Virginia universities. “We’ve taught ourselves a lot, and learned the hard way – by doing,” LaCour said. Of course, the data gleaned and engineering lessons learned will long outlast the mission.